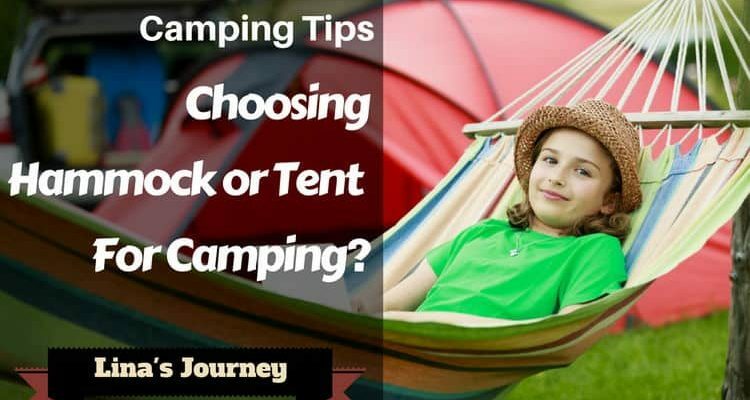 Blog » Camping » Tips & Tricks » Sleep » Hammock Vs Tent: Which Is Better For Your Complete Needs? When it comes down to choosing what gear to bring on a camping trip, the right option for you comes down to a number of factors. The length of your trip, conditions you expect to face, and your target environment all come into play here. Keeping all this in mind, one of the decisions you will face is whether you should bring a hammock vs tent for relaxation and sleeping arrangements. When faced with this choice, the above considerations are extremely important. Hammock Vs Tent: Which Is Better? Hammock Vs. Tent: Which One I Should Purchase? When Will A Hammock Suit Your Needs? When Is A Tent Your Best Choice? The decision about what piece of gear you choose ultimately comes down to skill level, with personal preference also being a big factor. Many advanced backpackers will be at ease with either, with a hammock being more of an accessory for any beginners. Some campers will even bring both to make the most of what each has to offer. It goes without saying that any semi-permanent campsite, backyard, or cottage will be enhanced with the addition of a hammock, as a spot to lounge in good weather. A hammock is less protected than a tent and requires a particular environment, or additional set of accessories, to pitch properly. Its design leaves campers exposed on top, with an additional tarp being necessary to provide any real comfort in less-than-ideal conditions. Many expert campers and backpackers prefer hammocks over tents because they usually take up less space and are easier to carry when taking on difficult treks. Coupled with a quality tarp, they can provide good protection. That being said, hammocks are not designed for beginner user and can take some getting used to. A tent is an adaptable, all-weather home away from home, in a sense. Tents provide superb protection from the elements, enabling you to tackle many different environments and conditions. They provide cover from all sides and offer a place to keep both yourself and the rest of your gear safe and dry. Any level of a camper, from beginner to advanced, will benefit from bringing a tent with them on any outing. They are able to double as a flat space to store and organize your belongings, or as a prep area to be used while going about your daily activities. A hammock is perfect if you plan on setting up camp for a few days or more for beginners. More advanced users can take a hammock with them into the most inhospitable of terrain, but substituting a hammock for a tent is not for everyone. Most campers will invariably opt for a tent when they plan on sleeping outdoors, especially when camping with other people. A hammock is, first and foremost, something that you will probably use to lounge in. The occasional nap is okay in a hammock, but unless it is set up with extreme care, they can cause serious strain on your back over time. This being said, camping hammocks are designed to alleviate these issues and do a very good job at ensuring ease of operation. Adding a tarp to cover your hammock is a useful addition, but many regular campers will still be left feeling exposed. More advanced users who plan to tackle long treks in extremely rough terrain might not have the benefit of being able to set up a tent where they please. In these situations, a camping hammock is extremely beneficial. 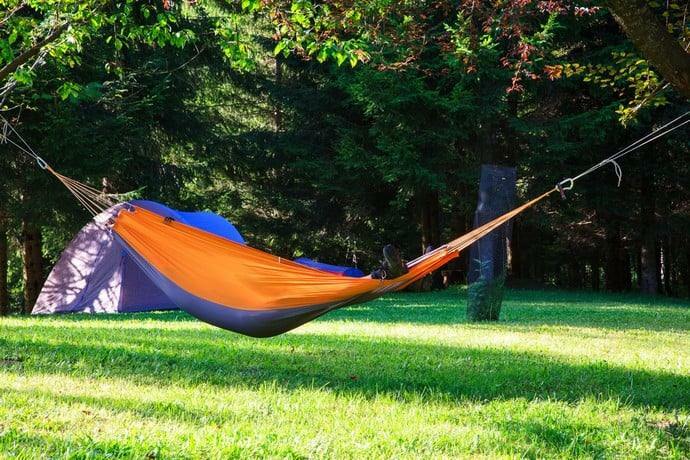 When the solid or dry ground is scarce, a hammock, with a tarp to cover it tightly, will keep you off the ground and protect you from the elements quite well. 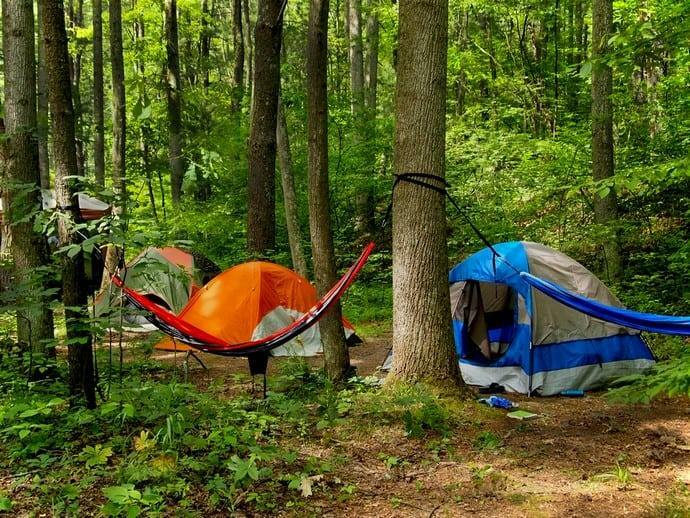 A camping hammock will always be smaller and lighter than a tent. This makes it infinitely easier to transport, especially if you plan on trekking long distances or tackling rough locales. Climbers and extreme survival experts can benefit from lightweight camping hammocks in these situations, as they can be incredibly adaptable to those who know how to use them properly. It may surprise you to hear that hammocks can still provide protection, even in cold climates. While they aren’t as good at keeping out the cold as a 4-season tent, hammocks will provide good protection when used with a quality sleeping bag and tarp cover. Even so, hammocks are usually only suited for warm, dry weather with no heavy wind. A tent has something for everyone, no matter your skill level. 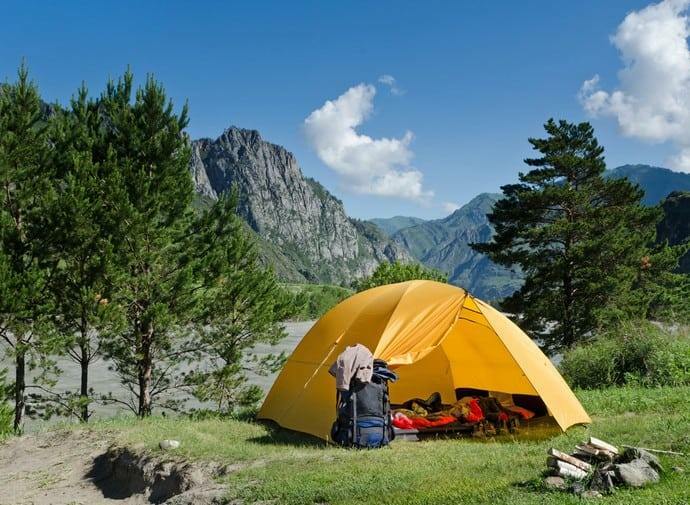 Tents are versatile and can easily tackle even the most extreme conditions, keeping you relatively comfortable. Hammocks do have their uses for beginner to intermediate users, especially when you plan to remain in one spot, but do not by any means replace the benefits of a tent. A tent will keep you comfortable when the weather takes a turn for the worse. Furthermore, tents will protect you and your gear, both from the elements and any curious wildlife in the area. A tent will suit campers of all skill levels and will always have more features than a hammock. If given the option, most campers will choose a tent unless circumstances make it ill-suited for your target environment. Tents are tried and true, with the vast majority of campers and backpackers being more than happy with the extra protection from the elements. A 3-season tent will be perfect for any camper in almost every environment. A 4-season tent is even specialized to keep you warm and dry in the coldest of conditions, which is much more than even the best hammocks can claim. Tents can be used in almost every location in the world in all climates. When it comes down to it, a camping hammock is a good call if you want to bring it along with a tent or carry one with you on your day trip. They will suit any level of a camper in this regard, but using one to sleep in should be considered carefully. 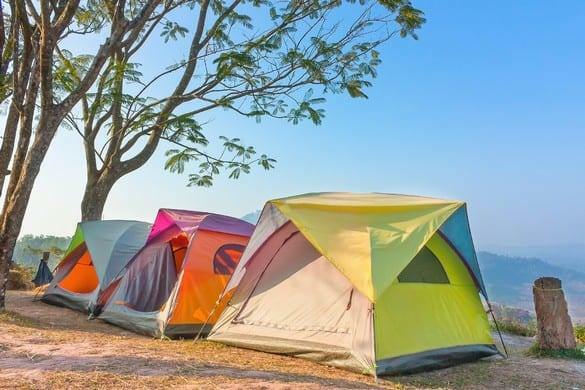 Tents are generally better-suited to overnight camping, as they provide protection from the elements that hammocks cannot.